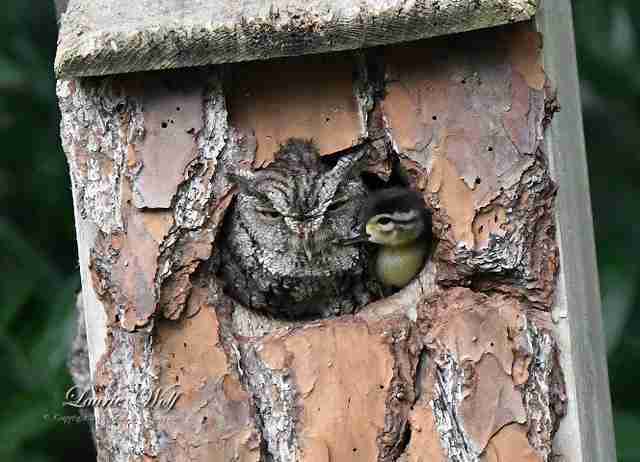 Laurie Wolf was hanging out in her backyard one day in early March, looking out over all the different birdhouses (also known as nesting boxes) she and her family have placed around, and suddenly noticed a mother wood duck moving one of her eggs from one box to another. “The box she took it from had been raided by something,” Wolf told The Dodo. It made sense that the mother had taken her egg and moved it to another box — but Wolf didn't see which one. She didn’t think much of it, although she hoped the egg was somewhere safe. The whole occurrence faded from her mind until about a month later, when she saw the strangest and most adorable sight emerge from one of the boxes. Wolf was aware that the day after she saw the mother duck move her egg, an owl had moved into one of the boxes, but it never occurred to her that the owl and egg may have been living in the same box — until two very unlikely friends poked their heads out of the box together. 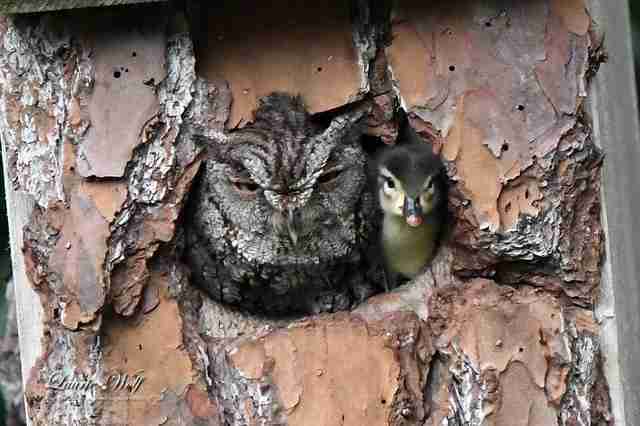 “I had seen something fuzzy disappear from the hole of this particular box, around 4 p.m. that day, so I not only thought we had a baby owlet but also kept an eye on the box for the next two hours, when suddenly the owl and duckling appeared together in the doorway,” Wolf said. Somehow, the owl must have known that the lone egg needed help, and so she cared for it and eventually hatched it herself, keeping the duckling company until the little guy could find his way back to his family. The pair seemed incredibly comfortable together as they cozied up to each other in the door of the box, and it was certainly a sight unlike any other. Wood ducklings usually leave their nests 24 hours after they hatch, after they hear their parents calling for them. Wolf watched over the next 30 minutes as the duckling and the owl popped in and out of view together, the duckling chirping all the while, until finally, his worried parents heard his cries. “We assume it heard them because it suddenly jumped from the box and made a beeline for our back fence and our neighbor's yard where there's a pond and the adult wood ducks have been seen by us,” Wolf said. The duckling and the owl parted ways at that point as the little guy ran off to be reunited with his family, after a kind stranger kept him safe and warm for as long as she had to.